Our son's school has a big spring event every year and one component of the event is a big bake sale. How much did I LOVE being asked by multiple teachers to bake some goods for the event? VERY much. I made my favorite Sea Salt Caramel Brownie by request. And I wanted to mix it up a bit. 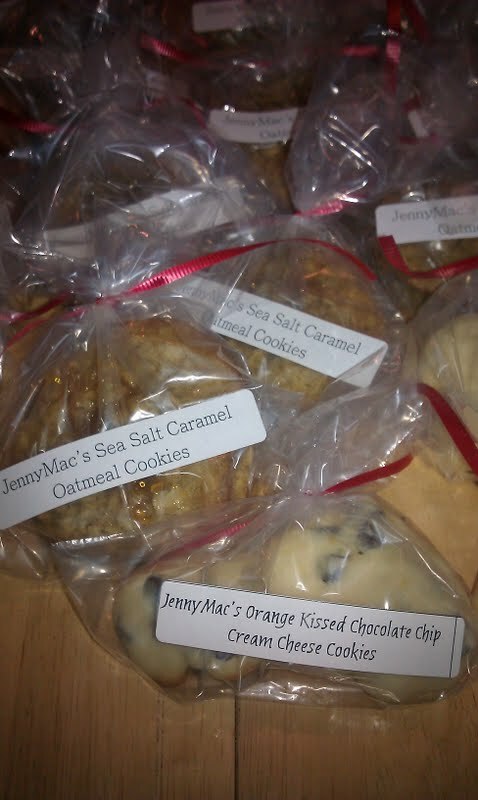 I used my Mom's Oatmeal Cookie recipe and added Sea Salt Caramel to those as well. YUM. And I also made perhaps my new favorite cookie: Orange Kissed Chocolate Chip Cream Cheese. YUM. So I spend hours last night baking, bagging, ribboning, tagging all the treats and box them up for the trip to school this am. I also decide to bring in a dozen or more of each to the office this morning. One easy way to make people smile? 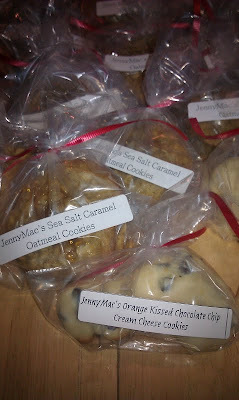 Pass out homemade baked goods first thing Friday morning at your office instead of working. Especially when you work with great people who LOVE baked goods! I was already having a great morning because 1. great sleep. 2. awesome AM workout. 3. super cute and giggling boy in my house this am. 4. handsome (albeit sleepy) husband but still made my tea for me just the way I like it. 5. We allowed MiniMac to bring his guitar to school for "Toy Share Day" even though it is clearly not a toy (and you, Bonkers McNewKid better NOT even touch it!) During the commute to school, MiniMac and I were at a stoplight, listening (and rocking out) to Joe Walsh sing Rocky Mountain Way. Windows slightly down to feel the awesome morning breeze and both of us belting out the lyrics at top volume, and MiniMac strumming away on his guitar which is bigger than him and his booster seat combined. A truck next to us caught the corner of my eye and the driver motioned me to put down the passenger window. I did and the driver told me, "That is one of the coolest things I have ever seen. That tiny kid playing that big guitar!" I replied, "I think so too!" Another way to make people smile? Take a minute to acknowledge something important to them. I meant, I'm gonna make some of these. And you know I love any reference to Bonkers McNewKid....every class has one!! Every time I see sea salt caramel stuff, I always think of you. @ed, you know I will share the recipes! Awesome!!!! I love that the guy in the truck said something about your duet. Love it! What I do not love? That you referred to a cookie that combines 3 of my favorite things (chocolate, orange and cream cheese) yet did not share the recipe! Ooo this is one of the few times I wished I lived in the south. Sea Salt Caramel Oatmeal Cookies?!! Holy crap! Ha! I've been baking all week too! For an open house at my hubby's fire hall. I'm about to go make some Italian buttercream for the mini cupcakes. Baked goods do make people smile...I hope they make the people here vote for a new fire house! Sounds like a perfectly wonderful day! PS When do you sleep? I can see you two in the car now! So the oatmeal cookie recipe??? Is that going up soon? Just one question.... how in the world do you find time to bake? and not just one thing... three! My hat is off to you, and I may just make time to try one of them! Happy weekend. You know, I'm a good cook but an absolutely lousy baker. I just don't have he patience for cookie-making. Those sound delicious, though. It's a good thing you live where you do because my diet would be shot if you lived here. lol! :) You made me smile too. Your little man is quite the rock star - he's gonna make a positive mark on this world. you always make me smile! seriously and I love how you make others smile too. It's more than the cookies, it's the "love baked in" and I understand that...that's why I send cards, emails, texts to people to just let them know that someone is thinking of them. I had to stop visiting for a little while because I wanted your treats and was getting fat just reading about them. I had to return, however, because I saw this recipe title in my reader and I about had a heart attack. I want some. Bring them to me, please. I will pay. Not really, but I can pay in compliments.